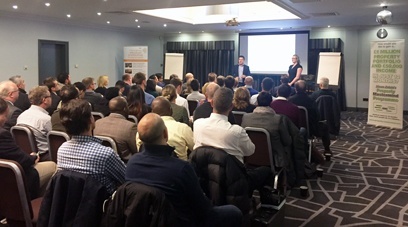 The last Coventry Property Investor Network (PIN) meeting of the year was held on Tuesday 8th November at the Village Hotel in Coventry. The meeting will return in January, on the second Tuesday of the month, following a break in December. The working partners kicked off the presentation slots for the evening, with Nick Hope, of Hope Financial Services providing an update on the mortgage market. Homemaker Properties’ Anthony McMullan and Jolene Higgins, followed with some answers to Landlord Frequently Asked Questions. The main speakers for the evening were Julian Maurice and Jonathan Guppy. Both offering fantastic advice and tips on refurbishing properties and making your property stand out in a bland marketplace. Great presentations leaving landlord and investors with lots to think about! Coventry PIN meeting is held on the second Tuesday of every month, except December and August. Each meeting is hosted by Sebastien Buhour, a Property Investor with over 25 investment properties across multiple countries. The event is a great opportunity to network with other like-minded investors and pick up helpful learnings to help progress your property investment journey. The Homemaker team will return for the next PIN meeting, which will be held on Tuesday 10th January 2017. For more information on the event speakers and to book your place at the next meeting, visit www.pinmeeting.co.uk/coventry. If you have never attended a PIN meeting before, you can get FREE entry by entering voucher code ‘Homemaker’.